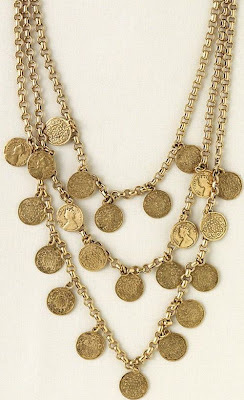 Oh Wow, love this coin necklace. What a sweet giveaway. Those bead bracelets are adorable. Loved that summer ocean theme going on. So much to choose from. Great to have one of their parties. So many cool things to choose from. The Sunset bracelet is at the top of my list. I know, it just had to be McQueen, and the dress is perfection! She's definitely got extremely good taste! what a great website -- i am loving stella and dot's funky bracelets, especially the double wrap leather ones! OBSESSED with the After Midnight Necklace! It's so pretty. Fun! I love the Together Forever necklace! My fave item is the Audrey Cluster Necklace (ironic?) haha. I'm a follower through GFC/Blogger & Twitter! I'm torn between the Charlotte statement necklace and the after midnight necklace. I love the coin necklace!!! Happy Friday Erika! Love that coin necklace. Hope you are heading into a long and relaxing weekend! My favorite item is the Goa Pendant earrings!! They're so ridiculously cute! Oh, and I forgot, I'm a follower! They have some amazing things! I love the pave clover necklace but I do love all the other longer necklaces also. Fantastic! I just tweeted about this. Not sure how to do the URL but here goes! Okay, that's not it. But I did do it! And I'm a follower for sure! 1. Love, Love, love stella & dot and I love the the little letter charms. I bought one for my little guy's collar! Awesome place.... I am still going thru all the beauties that they have. I loved the: "Vintage Cluster Ring"... I am sooo wanting to get it. This is a great giveaway, for sure. I am madly in love with the gold Belle Fleur ring. That ring must grace my finger. Really! Hope you're having a good Friday, and I hope you were watching the wedding! I so love those bangles! Such beautiful items! I follow you on GFC and Twitter, and I love the Clover Wrap Bracelets. PS I am a follower of your awesome blog! my favorite stella & dot piece is the soiree studs! Great giveaway! Stella & Dot is great...I can't decide my fav, but I love all the ultra layered chain necklaces and the wrapped leather bracelets! And I'm a follower bien sur! also, I'm a follower via google reader! Oh How amazing! I just stumbled upon you and absolutly love your blog. I can't get enough of the Azure Couture Earrings at Stella & Dot! Count me in! I really like the Heirloom Deco Bracelet! and I love the Bamboleo Necklace! I love the Vintage Cluster Ring! So adorable! I am a follower on Blogger and Twitter! Fun giveaway! I'm loving the La Coco Gold Pearl Strand. I also follow you on Blogger! I've followed Cafe Fashionista and tweeted about the giveaway! My favorite piece is the"On the Mark Necklace"
The Birds of Paradise necklace is AMAZING. I follow via GFC too! i love the copa necklace! just lovely. One of my favorite Stella & Dot pieces is the Ever After necklace! I would looooove the Medina Bib Necklace! It's simply gorgeous! I love the Medina Bib Necklace! I love Medina Bib Necklace! The coin necklace is so cute! My favorite piece is the bamboleo necklace! http://twitter.com/#!/addieusc/status/65087222268956672 - I tweeted about the giveaway! Love the Bamboleo necklace! wow! what a great giveaway. there are so many great pieces on the site but i think i'll go with the Camilla necklace. and yes, i am already a follower of yours everywhere! It's so fresh! But I've been in love with the Silk Charm Necklace and Bracelet Wrap in any color really! Don’t forget the things you once you owned. Treasure the things youcan’t get. Don't give up the things that belong to you and keep thoselost things in memory. My favorite item is the Ladybug Studs! I am a follower on GFC and twitter and bloglovin! I am a fan of Stella and dot on facebook! I love the After Midnight necklace! I tweeted about this giveaway (http://twitter.com/#!/zamoragx), became a follower of Cafe Fashionista on Twitter and became a fan of Stella & Dot on Facebook. 1. I love the sunset bangle!